Let me start by saying I love receiving books by small publishers. Nothing makes me happier to get to see what kinds of titles are being produced outside of the mainstream. And I really love it when someone takes an old idea and gives it a fresh spin. Nowhere Man: You Don’t Know Jack by Jerome Walford is the story of an NYPD detective using super powers he got in a mysterious accident trying (perhaps just a little too hard) to live up to the long shadow that his father left In the police department. What starts out as a routine case quickly spins out of control leaving Detective Jack Maguire in the middle of the biggest conspiracy of all time. All that’s been done before in other books but what I like is that the lead character is black. He’s not a walking stereotype but a real 3-D person with the kinds of problems that all men have and that works to the book’s favor. The problem is how do I give an in depth review what is essentially only the first chapter of 40 pages of a longer story? What kind of accident gave Jack his powers? How long has he had his powers? What happened to his father to make him try to hard? What is the conspiracy about that we start to learn of? The book kind of starts with no back story and then just stops with no real ending. I know that this is the first of at least 3 volumes and I wish that the author had waited until he had the 120 or so pages finished to release all at one time as I felt I came into a movie 5 minutes after it started and walked out after 30 and tried to write a review. I would like to know what’s going to happen next but this is a tough book for me to recommend. First off, I want you to click on this link and listen as you read. As I may have mentioned before, I am a student and lover of history. Every continent in every time period has fascinating stories just waiting to be told. 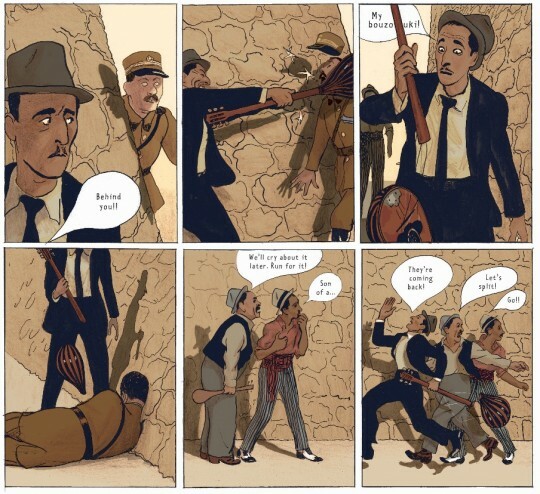 Rebetiko by David Prudhomme has been referred to as his masterpiece and I wish I could agree. I wanted to enjoy this book. I really did but the experience felt like trying to run through a swamp. I would slog and slog and then hit a patch where the author really nailed it and I was off and running for a little bit until I again had to wade through the next slow patch. Rebetiko refers to a kind of bluesy, jazzy Greek folk music popular in the 1920’s and 30’s. The book itself follow the lives of a group of musical rebels who fill their days with smoke, drink, women, settling debts, and of course the music itself and their story is told against a backdrop or a repressive military dictatorship. A clear parallel can be made, I think between Rebetiko music being a cry from a repressed people and poor African Americans in the delta almost needing to create the blues as a way of giving voice to their hopelessness. The irony, of course, is that repressed people are often the ones in a society with the most freedom to express themselves. As many problems as I may have had with the story his art is never less than amazing. Prudhomme has a painted style in this book that is very reminiscent of poster artwork of that time further grounding it in that time period. I also was fascinated by his use of shadows. Day or night, there are the shadows. People are sitting in them, walking through them, or casting them on the walls behind them. It is a subtle trick he uses that helps to convey not only the oppression that the Greek citizens lived under but also I think signifies the shadow of suspicion these artists and their music had cast on them by the ordinary citizens. All this comes down to if I can recommend it. Let me say this, comics are a marriage of art and words. If you removed the art you’d be left with a book. Remove the words and you still have a comic. And while the words might not be all I had hoped for the art is incredible and worth looking just for that if nothing else.